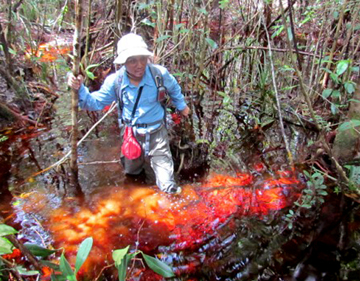 SOFYAN KURNIANTO came to the University of New Hampshire from his native Indonesia as part of a nascent effort to build the scientific capacity to help save the island archipelago's carbon-rich peat swamps. The forested peat swamps are increasingly under siege and their ultimate fate is termed "bleak" by some in the scientific community. 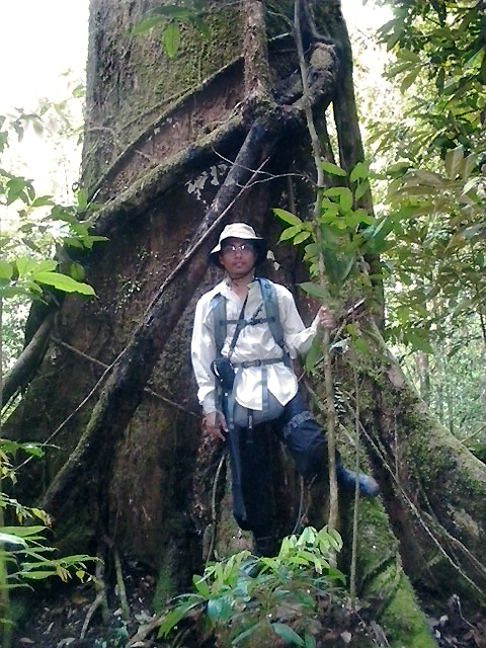 Master's student Sofyan Kurnianto in the Sebangau National Park, Indonesia. Photo by Matthew Warren, USDA Forest Service. As northern peatlands and their permafrost regions evolve under the warming temperatures of climate change, their very nature will change, but they likely won't disappear altogether. The same cannot be said of their tropical counterparts, which are being logged, drained, burned, and converted into oil palm plantations, agricultural fields, mining operations, and the like. And while there has been at least a modest amount of scientific effort to understand the functioning of northern peatlands to help project their carbon futures under various climate change scenarios, much less science has been conducted on those in the tropics. 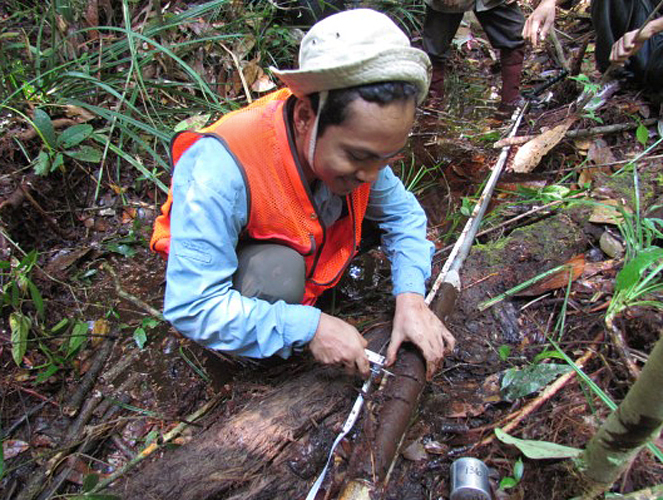 "There are big gaps and a general lack of information about tropical peat swamp forests," says Kurnianto, a first-year Earth Science master's student working with research professor Steve Frolking of the EOS Earth Systems Research Center. Frolking's focus is biogeochemical modeling and his research includes northern peatland ecosystems. "And one of the important research tools that needs to be developed is an ecosystem model for tropical peat swamp forests so we can estimate the past, present, and future condition of the ecosystem under global change." Kurnianto adds, "But there is no available ecosystem model for tropical peat swamp due to the lack of available data for parameterization, input, and validation." 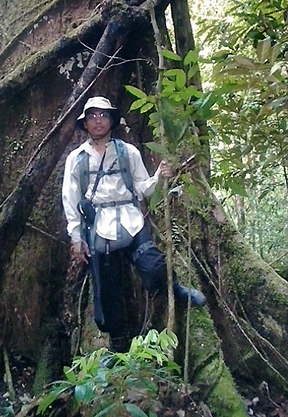 Kurnianto's work with Frolking, who has developed a simple model for northern peatlands, will be the first concerted effort to construct such a model for tropical peat swamp forests. The initial stages of that work involves a thorough literature review to compile what is currently known about these ancient, complex ecosystems. This will serve as the springboard to Kurnianto's master's thesis proposal next semester. It is hoped the literature review will reveal particulars such as the geography and ecology of tropical peat swamp forests, controls on net carbon exchange, long-term carbon accumulation and balance, greenhouse gas emission, land use change and disturbance, and climate change impact. If so, these will aid in building a model for tropical peat swamp forests, which will be done using Frolking's northern peatlands model as a template. "There are some hydrological models that have been applied to tropical peatlands," Frolking notes, "but none of what we call process-based or mechanistic models of the carbon and vegetation dynamics. So, essentially, nothing has been done." Kurnianto found his way to UNH by way of the Center for International Forestry Research (CIFOR) based in Bogor, Indonesia where he had been working for two years on climate change mitigation issues. CIFOR collaborates with the U.S. Forest Service estimating carbon stocks in Indonesian peatland and mangrove forests. One of the USFS collaborators is tropical ecologist Boone Kaufmann, who specializes in tropical wetland forests trying to understand carbon dynamics. Kaufmann worked for a time at the USFS office in Durham. 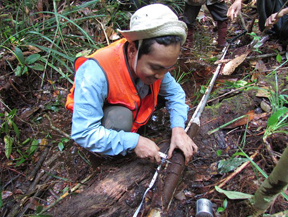 Kurnianto collects soil samples from tropical peat to determine carbon content. Says Frolking, "Boone was working with people at CIFOR and they wanted to get some modeling in their effort. A colleague I knew at the Forest Service here in Durham suggested that I contact Boone, because I've done peatland modeling." 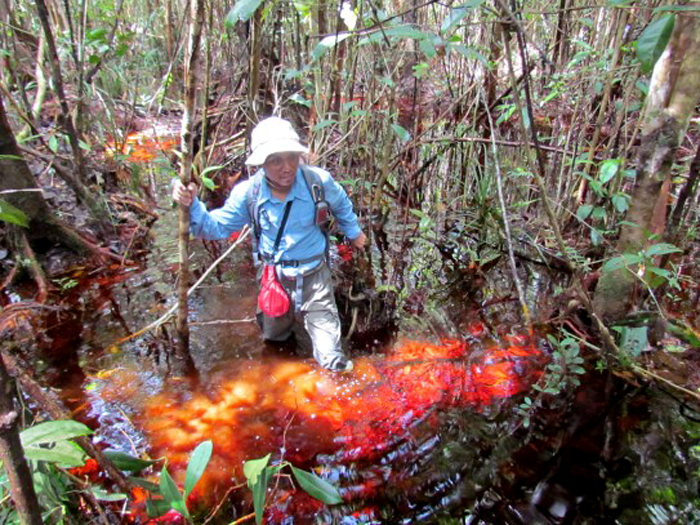 One thing led to the next and ultimately resulted in funding from the USFS to build some scientific capacity aimed at peat swamp forests in Indonesia. "So they've helped set up a lab there, provided some scientific equipment, done some training workshops, and provided funds for Sofyan to come here to do his master's work on a full research assistantship, which includes a tuition waiver from the College of Engineering and Physical Sciences," Frolking says. At CIFOR, Kurnianto is a research assistant in the Forest and Environment Programme specializing in measuring or calculating the carbon stock in tropical wetland ecosystems. "This experience provides me with knowledge about the real conditions of the peat swamp forests of my country," Kurnianto says, "and I think that gives me an advantage in the modeling work we're going to be doing." Frolking agrees. "Sofyan has done fieldwork in these systems so he has some experience and intuition. This will help him to develop a better model because developing a system model involves including some aspects you don't fully understand, so it's very valuable to have this constrained by reality." Frolking further asserts that, even with a paucity of data, as is the case with tropical peat swamp forests, and even with those ecosystems undergoing severe degradation to the point of possible extinction, being able to model those systems has inherent value. A waterlogged condition is one of the requirements for the peat accumulation process. The brown-reddish color, a typical color for peat water, is made by the organic material dissolved in the water. "It's a way to make projections, a way to make statements about how this system will respond. I think models also help people think about the system more as a system. They raise questions, identify data gaps, generate hypotheses, and help to synthesize data," says Frolking. From Frolking's perspective it's constructive to have interactions while measurements are going on, not just after. "For example, when I talk to field people, as a modeler I ask questions that wouldn't necessarily occur to them. So I think it broadens the intellectual dialogue around the topic to get people to better synthesize it while you're still trying to figure it all out." And there is certainly value in doing all that given what's at stake. Tropical peatlands are important because there is a lot of carbon in them vis-à-vis climate change/global warming. And there is tremendous biodiversity, including tropical hardwood trees and "charismatic megafuana" like tigers and primates, which will be gone when the ecosystem is gone, or housed in zoos. "Moreover," Frolking notes, "it took thousands to tens of thousands of years to develop these ecosystems and when they're gone you can't regrow them. You can regrow the trees but you can't reestablish the ecosystem." It is hoped that the tropical peat swamp forest model Kurnianto will build during his time at EOS will prove useful for looking at how fast these systems lose carbon if they're disturbed and, if reflooded, how fast they return to storing carbon. That won't provide the answer – it will be just another brick in the wall that could perhaps be incorporated into another model. And in this case, it might be a big brick in the scientific capacity building as Indonesia strives to save these ecosystems some experts have noted "could easily just go away" in a matter of decades should business as usual rule the day.